On Friday the 23rd November we went to Allenby Primary School, next to DWHS. In the morning, we did competitive activities. We had lots of fun and it warmed us up. After lunch we had matches, there were two teams Tudor 1 and Tudor 2. The team was great they dodged all the tagging and ended up winning their first game. Tudor 2 won 2 matches but unfortunately we didn’t make it to the finals. Tudor 1 was also great. Allenby 1 ended up winning and Allenby 2 came second. Overall it was great and fun. On Tuesday 6th of November my classmates went on a trip to compete in the tag-rugby tournament. When we first arrived we didn’t know most of the rules as we had only done tag-rugby for 4 weeks. At first we luckily tied because the other team couldn’t score as we had put up a great defence. Unfortunately, we had to play against L’Ealing and we lost as they had been playing for years. In total we won 5 matches and we lost about 4. As this was our first ever tournament, we did quite well. Other teams captains came over to congratulate us. We also got to take a picture with a mascot horse which we named “Donkey Man”. Team: Simran, Jasmeen, Kiran, Manahil, Fatima, Usman, Khalid, Mehedy, Lovepreet, Nikhil. 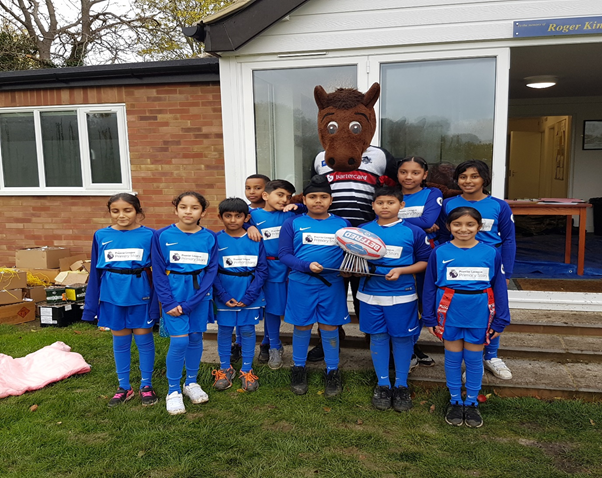 On Thursday 9th October, with several of my classmates, I went to Ealing Trailfinders to attend a tag rugby tournament, we had a lot of fun there. We were placed on the real grass pitch out of the two pitches and we began to get some last minute practise, we felt nervous when we first arrived. In the first 2 games we had a solid defence and no points were scored against us. That was only the beginning and it got much harder from there, we won with a two and one point difference to us. In the third match, we were beaten badly, we tried our best but our defence was not strong enough to fend off the opponents, in the end we were beaten by 3 points. This discouraged us quite a lot but in the end we decided to forget that we lost and we practised some more. At that point we were determined not to lose any more games but then we lost another game and this put our team spirit down by a lot, having two loses in a row is really discouraging but we still didn’t give up. The next match was a draw and that was one of the teams that went to the quarter finals, if we had received one more point or if we didn’t lose two points we could have gone to the quarter finals, sadly we didn’t.